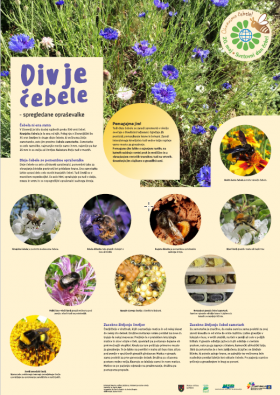 Together with Municipality of Ljubljana, we printed posters about wild bees and wild pollinators. So far, over 500 species of bees have been found in Slovenia. Wild pollinators, including bees, bumblebees and wasps, are important for biodiversity and ecosystem services of pollination for food production. 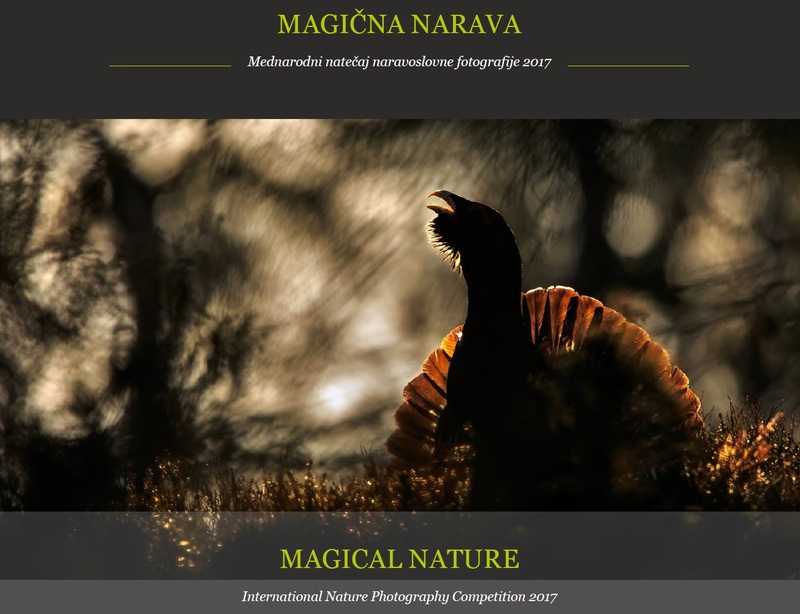 Catalog of the international competition of nature photography Magical Nature 2017 (B.7) exhibits selection of best photographs from six categories: Mammals, Birds, Other animals, Plants, Natural Landscapes, Man and nature. The competition was organized by the Association of Slovenian Nature Photographers. 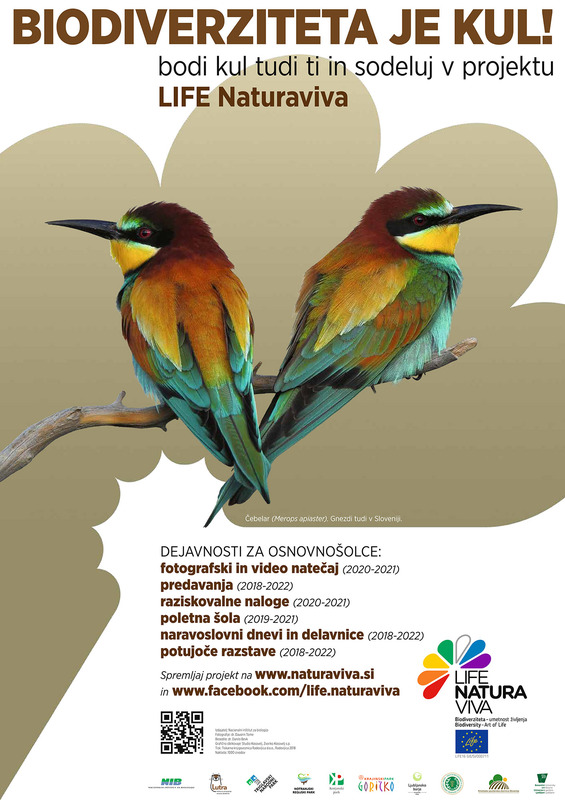 For the promotion of project activities for elementary school pupils, we prepared a promotional poster (B.3) with a very colorful species of bird that lives also in Slovenia – European bee-eater (Merops apiaster). Posters will be distributed to schools throughout Slovenia. The first year of the project was devoted to the preparation of the communication strategy of the project (A.1). Strategy is a result of joint work of all project members that participated at two workshops under the guidance and advice of the expert in nature conservation communication, Špela Polak. 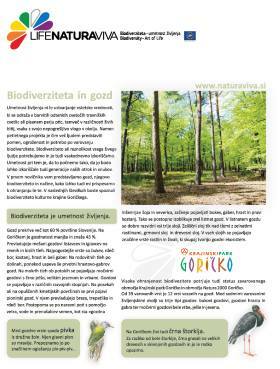 The first number of news for households in Goričko protected area (D.1) was published and is dedicated to biodiversity in the forest. More than 8,300 households in the area of Goričko Nature Park will receive the printed news. In the future, we will use it as material at different events of the project. We have prepared PowerPoint slides and transcript with general information about biodiversity that is intended for educational purposes (B.1). The content includes information about biodiversity in general and in Slovenia. Slides are freely available for educational purposes with reference to authors. 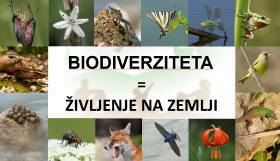 The advertising campaign on posters in cities will promote biodiversity in Slovenia (B.1). With the first motives, we want to present the concept of biodiversity to the public. The first version of the poster includes images of fauna and flora of Slovenia. The second motif of the poster shows how biodiversity exists all over the world. We selected photographs from different ecosystems and continents. Posters will be displayed in different cities of Slovenia at different periods until spring. The third motif of the poster was devoted to water biodiversity. We included different species, some exclusively living in water and some only using it as part of their habitat, some in freshwater and some in sea. We created first promotional material (D.1). Pens are made of recycled materials (paper and plastic) and wood. Caps are practical to use in the field. Magnets were made by organization of workers with disabilities and promote five project flagship species. T-shirts promote project design and logos. The coloring book with different animal and plant species typical for the Ljubljana marsh presents the biodiversity to the young generation – children. In the Krajinski park Ljubljansko barje we will distribute it at our activities in kindergartens, schools and other events inside and outside the park (D.1). Newsletter is prepared for the youngest visitors of the Triglav National Park, where they can learn everything about the fantastic diversity of life – biodiversity. We have distributed the newsletter to more than 7000 pupils from 39 primary schools and it is also freely available in park’s info centers. Biodiversity in the garden and orchard is presented in the second issue of our Newsletter. Because of their vicinity to humans, both important habitats are often overlooked as an habitat of plants and animals. Presentation of garden biodiversity is enriched with a short summary of the two lectures on the importance of maintaining biodiverse gardens.